Demetri is a pioneer in the development of imatinib (Gleevec)-one of the first targeted anticancer therapies-that is now approved in 10 indications as a treatment for chronic myeloid leukemia and other hematologic malignancies, and for gastrointestinal stromal tumors (GISTs). His work subsequently contributed to the FDA approval of several other "smart drugs" for cancer treatment, including sunitinib in GIST, and, most recently, pazopanib for other sarcomas. He has designed and implemented a world-renowned clinical research center focused on the treatment of sarcomas, and his team is at the cutting edge of developing personalized cancer therapeutics for specific subtypes of sarcomas. Outside of the laboratory, Demetri serves as the chair of the Medical Advisory Board of the Sarcoma Foundation of America and is a member of the board of the Hope Funds for Cancer Research. He is also the co-principal investigator for the country's only multi-institutional SPORE grant awarded to the Sarcoma Alliance for Research through Collaboration from the National Cancer Institute. 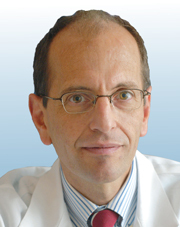 Demetri has received many awards, including a Focused Giving Program Award from the Johnson and Johnson Foundation in 1993, the Emil J. Freireich Award in Clinical Cancer Research from the MD Anderson Cancer Center in 2002, the Alexander Bodini Foundation Prize for Scientific Excellence in Medicine in 2009, and the Hope Funds for Cancer Research Award for Developmental Therapeutics in 2010.